Spanish era map of Batangas. Image source: National Library of the Philippines. Above is an apparent Spanish colonial era map of the Province of Batangas downloaded from the National Library of the Philippines Digital Collections. Unfortunately, neither the map nor the National Library of the Philippines provides the date when the map was created. A quick examination, however, of the text at the bottom says that the province’s products are arroz (rice), café (coffee), cacao and azucar gives us the clue that it was made in the 19th century, since Batangas became known worldwide for its production of coffee at the time. The map above has been resized for faster Internet download. Those who wish to view or download a higher resolution version, please follow this link to the National Library of the Philippines file: Provincia de Batangas, Gobierno Civil. 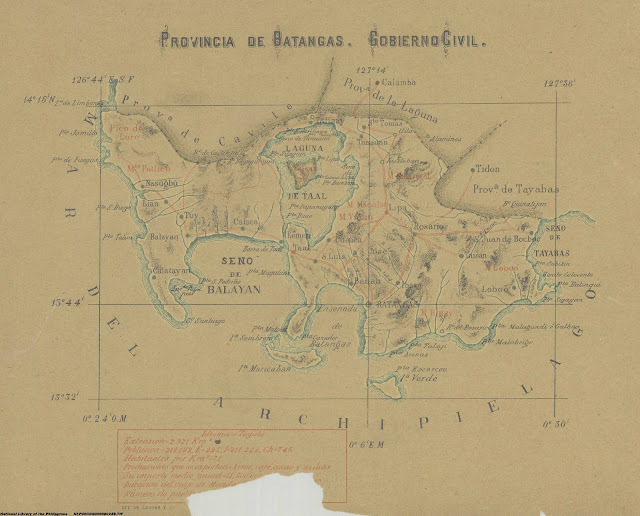 Provincia de Batangas, Gobierno Civil, online at the National Library of the Philippines Digital Collections.